Most companies talk about the Four C’s, but at Norton’s we have added a Fifth C – Certification, which we feel is as crucial as the other four. 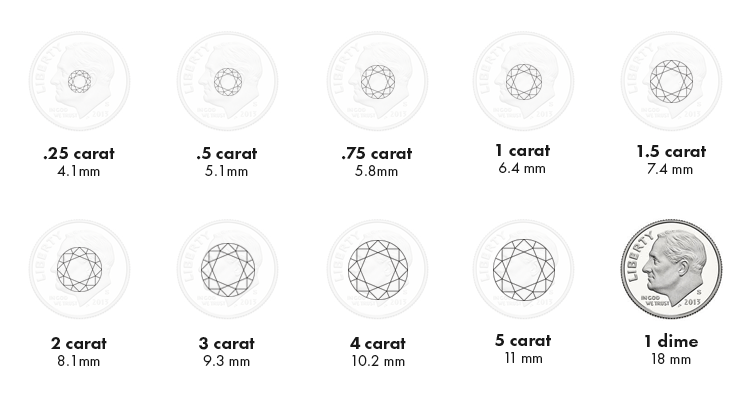 While the Five C's do not fully describe the individuality of each diamond, it is advisable to have a basic understanding of what they measure and describe, and how they affect the price before purchasing a diamond. It is important to keep in mind that each person will weigh the importance of each of the Five C’s differently, and that is OK. The word 'carat' comes from the carob tree whose seed was used as the standard of weighing precious stones many years ago. Less than 5% of all the diamonds made into jewellery are larger than one carat. Carat is the gemologist's standard measure of a diamond's weight. One carat is divided into 100 points so that a diamond of 50 points is described as a 1/2 carat. You may want the largest diamond possible, and as you go through the Five C’s you will see that many factors affect the price of a diamond. For instance, the millimeter diameter (or size) of a stone is very much affected by the proportions, or Cut Grade. Because diamonds formed deep within the earth, under extreme heat and pressure, they often contain unique birthmarks, either internal or external. Although a high Clarity grade is often prized and affects the rarity, unless the internal markings are eye visible they have little impact on the beauty of the diamond. Clarity is a measure of the number and size of the internal markings that occur in all but the rarest of diamonds. Many different terms are used to describe these internal markings, such as blemishes, inclusions, etc. but they all simply describe “nature’s birthmarks”. Internal markings that are eye visible may affect your enjoyment of your diamond's beauty, depending on the size and location of the inclusions. Large inclusions may interfere with the light entering your diamond, reducing it's sparkle and brilliance. Flawless or Internally Flawless diamonds are very rare and costly. FL-IF No inclusions visible (by an expert) under 10X magnification. VVS1 -VVS2 Minute, extremely difficult to find under 10X magnification. VS1 -VS2 Minor, difficult to find under 10X magnification. SI1 -SI2 Noticeable, relatively easy to find under10X. I1 –I3 Obvious under10X. Just visible, or visible to the naked eye. Color refers to a diamond's lack of color, grading the whiteness of a diamond. Colorless diamonds are at the top of the color scale, or D Color, while Z is at the lowest. The higher the color (or absence of color) the greater the value. The traces of color can be yellow, brown or grey. Beyond Z color are Fancy color diamonds – see menu for more information. Color is considered to be one of the most important factors as it is what the eye sees, similar to the impact of Cut. J-I Near-colorless. A slight warmth of color or tone may be visible to the eye. H-G Near-colorless. Appears white unless compared side-by-side against diamonds of higher color. F-E Colorless. Only a minute hint of color can be detected by an expert gemologist. D Absolutely colorless. Very rare. What makes a diamond beautiful and so very eye-catching is how well a diamond plays with light. A diamond is essentially a collection of prisms and mirrors. The alignment of these prisms and mirrors is what makes one diamond beautiful, and another one lackluster. Proper proportions will maximize its beauty and brilliance. There is a balance of fire and dispersion (or colored light) and brilliance and scintillation (or white light) in every diamond depending on the cut. Ultimately this all comes together in what we think of as the sparkle of a diamond. A well-cut diamond will direct more light through the crown. A diamond with a depth that's too shallow or too deep will allow light to leak out through the sides or the bottom of the stone. The cut is the one “C” not determined by nature, but by the diamond cutter. With each unique rough diamond crystal the cutter must balance the weight retention (a larger diamond) with beauty or cut. Norton’s carries a range of cuts for different tastes and budgets. A diamond certificate is more accurately a grading report, as it does not “certify” anything. Rather, it just reports on a particular diamond’s characteristics such as colour and clarity. They also do not give any retail values or pricing. Norton’s carries the most respected laboratory grading reports such as Gemological Institute of America (GIA) and American Gem Society (AGS). These are both non-profit labs. There are dozens of labs, many of them for profit and may not reflect grades that are as rigorous as GIA and AGS. When comparing prices on diamonds the grading report or certificate can have a huge impact.